We’re an endangered species, doc. 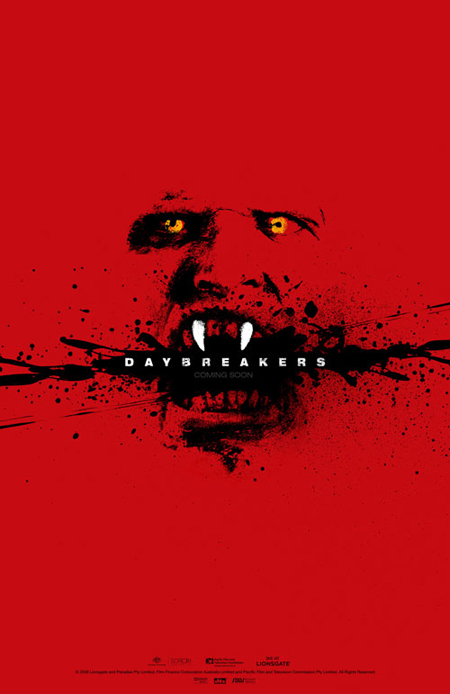 Ethan Hawke, Willem Dafoe and Sam Neill will (probably) be the people you recognize the most in Daybreakers. Keep on clicking if you want to read what I (for the most part, a vampire fan) have to say about this movie. (Hint: It’s not all bad!) No spoilers. Short synopsis: A plague has converted most of the humans and animals of the world into vampires. With less then %5 of the human population remaining, the existing vampires are attempting to either create a blood substitute or figure out a way to find more humans and harvest their blood before time runs out and there is no blood left. It’s 2019 , Hematologist Edward Dalton (Ethan Hawke) works for a major corporation that supplies much of the world with blood, by farming humans the Vampire Army (VA) captures and brings to them. It’s been discovered that when a vampire does not consume blood for some time they turn into bat-like creatures, very angry and very animal like. Because of the blood shortage there are more and more vampires turning into these creatures and living in the sewers and underground of the city. Dalton has a problem with consuming human blood, so he doesn’t. He wants to create a blood substitute so the world can stop hunting humans and they can come out of hiding and (basically) breed without worrying about being hunted. He runs across a small group of humans and helps them hide from the vampire police. They start to trust him and, when they find out he’s a researcher, they recruit him to help them figure out how to recreate the cure one man (Willem Dafoe) stumbled upon. The movie does a good job of portraying a mostly-vampire world in a realistic light. People live their daily lives from sun down to sun up. They drive cars with sun shields and video cameras, they sleep in light-tight places. The vampires can go out during the day, as long as their skin is completely covered. They can walk in the shade in normal clothing, but cannot touch sunlight, and they don’t seem any stronger or superior than humans, other than not being able to die due to disease, etc. Scenes didn’t concentrate too long on one thing, the pacing was good. It had its moments of pure gore, thick and juicy gore, and the vampires literally exploded when staked, so at times the realistic nature of the whole thing went out the window, but only temporarily. There were some fun parts, some odd lines that you could hear in the background. For example, a newscast broadcasted that the leading cause of wild fires was because of Vampiric animals venturing out during the day. (Just visual a squirrel bursting into flames the next time you see one, it’s kinda funny.) By far, Willem Dafoe’s character, “Elvis,” had the best lines and gave the movie a much needed light-hearted feel during the dark times. While one could say this is just another vampire movie, I’m going to go out on a limb and say this one stands out above the rest. It’s an interesting look at an alternative mostly-vampire future and fans of the genre should give this one a chance. No sparkles, no romance! Tagged Daybreakers, review: movie, vampires.